24/1/2012 St John’s college communion service, held in the College Chapel. The chapel was too crampt to create an image so this was done much later. 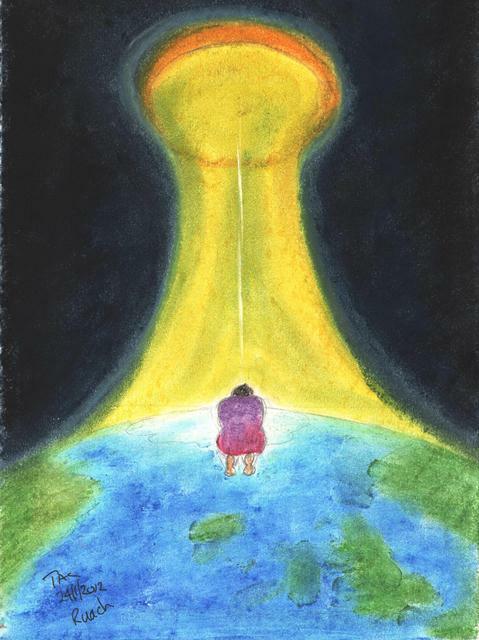 It was inspired by the intercessory prayers and connected with an idea that came to me about the prayers of the saints filling up golden bowls in heaven that would empty out over the earth. It occurred to me later that the image looked a little like the Aurora Borealis that has been in the news recently. Aurora is a Roman goddess and Borealis means ‘northern wind’ and that gave me the idea for the name: Ruach which often translates as ‘the Spirit of God’ where the imagery for Spirit is that of ‘wind’. I like the idea that Prayer is somehow wrapped up in catching the ‘Wind of God’.